I get asked about what we use to replace wheat flour often. White rice flour: Although it can lead to poor texture when used alone, white rice is valuable in a blend because it has a neutral flavor and it adds volume without being too heavy or gummy. Brown rice flour: Brown rice brings to the party a little more nutrition, more complexity in flavor, and a little color (nobody wants white-as-a-sheet bread). Potato starch: Soft, powdery, and much less gritty than either type of rice flour, potato starch is nice and tenderizing. Much like corn starch can thicken a gravy, it adds that chewy gluten-like action in GF doughs. One final component that can be crucial in many GF items is xanthan gum. We don’t blend this in because I find that the amount you want in different items varies widely and can be disastrous if wrong. Too much xanthan gum and your item will never bake through, staying gummy and custard-y no matter how long it’s in the oven; add too little and it will be dry and fall apart. Most good gluten-free baking recipes will advise an amount to add (usually less than a teaspoon), and it’s best to add it to your flour blend ad hoc. Note that you can’t sub this blend in for wheat flour in most normal glutinous recipes (you use much less flour for GF breads, for example), but when used appropriately we find that the results with this combination can be just as good if not better than their gluten-full counterparts. 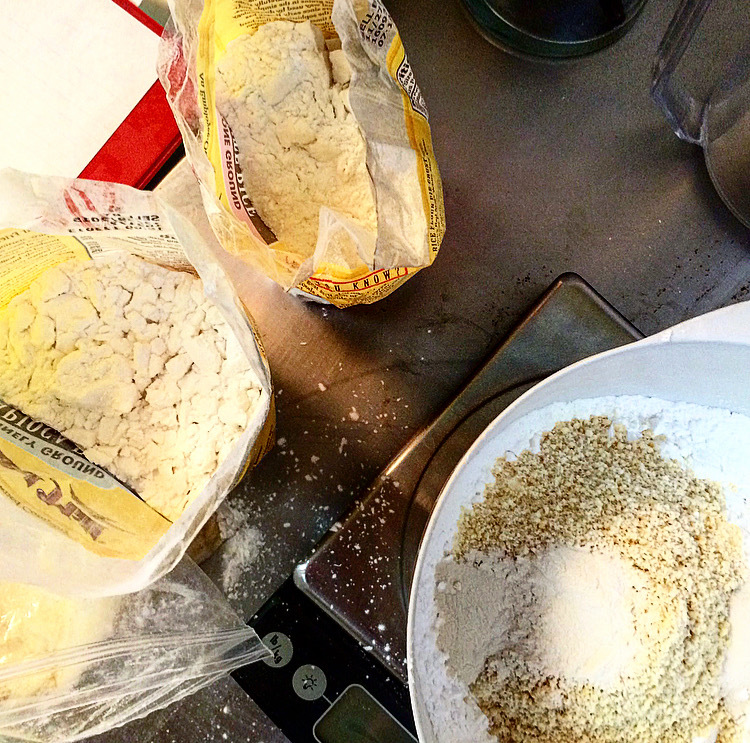 Try it and let me know what you think, or which gluten-free flours you’ve had success with!